I absolutely adore Dani. She is strong and determined yet vulnerable too. Her outlook on life is wonderful despite all the things that happen to get in her way. At the heart of every book is her relationships. The one with her father is a loving one but fraught with difficulties as he has his own issues to deal with. Ella is her best friend who moved away and whom Dani misses terribly. 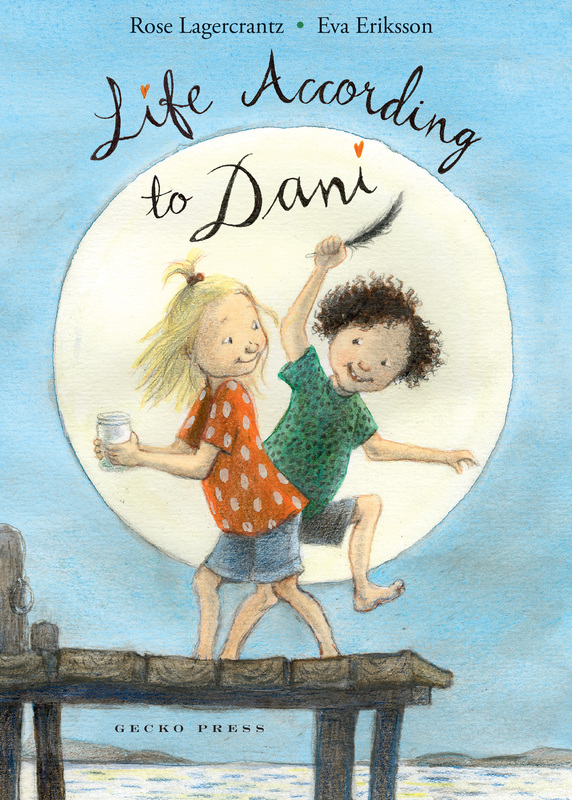 Author Rose Lagercrantz pulls at the heartstrings in every book about Dani. While they are all stand-alone books, read together they build a bigger picture of Dani and her life. I find myself so proud of Dani and her achievements; big and small. I also want to just give her a big hug. The power of good writing is making believable characters and Lagercrantz continues to do that. Dani is very real and so adorable with just the right amount of sweetness. This time, Dani decides to give her faraway friend Ella, the best birthday present; herself. Dani attempts to visit Ella far away which puts her in danger and sets up a whole new adventure for Dani. Eva Eriksson amazes me that Dani is the same in all the books. Dani has the same beautiful smile and the same inquisitive eyes. The line drawings are simple yet show depth and emotion; humour and sadness, with real feeling. A lovely feel-good chapter book for newly independent readers. 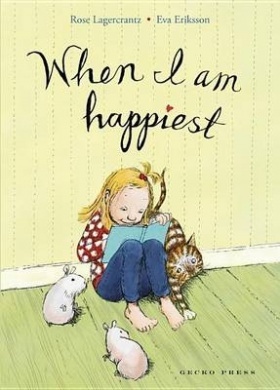 Another beautiful book in the My happy life series to treasure. 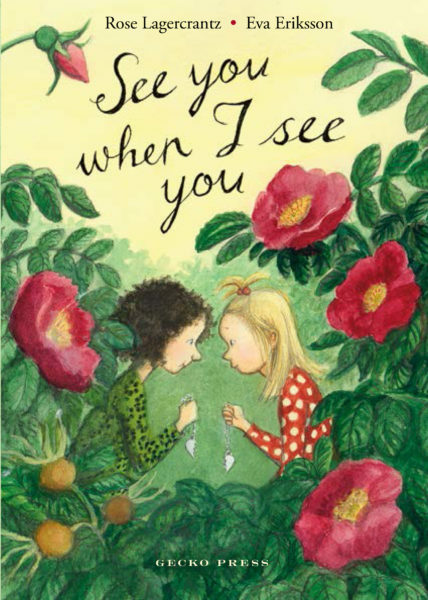 See you when I see you by Rose Lagercrantz and illustrated by Eva Eriksson @geckopress : Best friends Dani and Ella back together for another adventure. Those who have read my previous reviews about Dani and her best friend Ella will know how much I love these books. The latest book is no exception. While part of a series each book can still be thoroughly enjoyed as a stand-alone. Dani lives alone with her dad as mum died when she was very young. It has always been the two of them but lately dad has Sadie, a nurse he met in hospital after he had an accident. The two have become very close and Dani feels a little lost and perhaps a little jealous. More so since her best friend Ella had to move away. A class trip to Skansen zoo goes wrong when Dani is separated from the rest of her class. However, a coincidence has Dani bump in to Ella who is also there on a class trip from her new school. Together, they have their own little adventure. I love how trusting, innocent and real Dani is. Her emotions are at times raw but real. She loves her best friend even when she disagrees with her. A book that deals with life, friendships, family and coming to terms with change. Delightfully illustrated by Eva Eriksson this book, like the others in the series, will be a hit for those newly independent readers reading their first chapter books. A sweet feel-good story to enjoy. I loved the first three books about Dani and book number four is no exception. As first chapter books go for new readers, this is perfect. Great line drawings once again, from illustrator Eva Eriksson break up the text and the font is just the right size, as are the short chapters. Dani and her father have almost always been on their own ever since mum died. Their relationship is tight and loving. While this is a stand-alone it does follow on from the previous book When I am happiest where dad had had a terrible accident and was in hospital recovering. 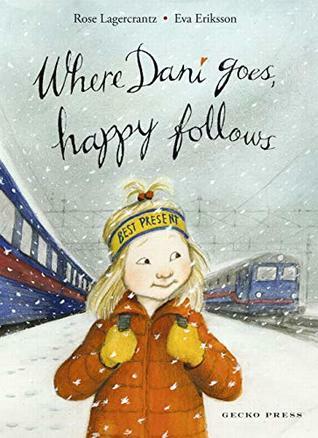 While in hospital Dani is sent to stay with her best friend in the world, Ella. Their relationship is also one of enduring love and friendship despite being separated when Ella moved away. Now together they are having fun fishing and exploring and just enjoying each others company. Dad rings Dani every night just to chat until one night the phone doesn’t ring. Dani begins to worry and as a character I have grown to adore, I can’t help but feel for her and her concerns that maybe Dad has forgotten her. Of course he hasn’t but soon after he turns up on the island accompanied by his nurse. His nurse however, is now an important person in his life and Dani has much to deal with and it is a struggle for all concerned. I love how Ella jumps to Dani’s defense when Dani begins to sulk and gets cross with her father. The honesty of friendships is so important and I know readers will recognize their own best friends when reading about Dani and Ella. Another sweet adventure in the life of Dani and her best friend Ella. If you have read the others, you will definitely want the latest. If you haven’t met Dani and Ella, check out this new story and you will be wanting to find the rest. My happy life and My heart is laughing are the first two books about Dani, her dad and best friend Ella. They offer a wonderful insight into the day-to-day life of a young girl as she begins to find her way in the world. In My happy life Ella moves away but with time and support Dani learns to accept that life sometimes offers challenges and she finds ways to cope with life. In Rose Lagercrantz’s latest story, When I am happiest it begins with the second-to-last day of school. Dani is so happy that she begins to write a book all about how happy she is. However, suddenly Dani’s world is turned upside down when her father has a serious accident and ends up in hospital. Dani must then overcome her biggest hurdle yet. There is both a softness and simplicity to Dani’s story and as a reader I couldn’t help but be moved by Dani’s situation and how she deals with whatever life throws at her. As with the previous books, this is another winning combination of writer and illustrator. Short chapters and a perfect sized text, gorgeous line drawings on every two page spread, make this ideal for readers of five-to-seven year olds new to chapter books. This is a heart-warming story that will leave readers with a warm fuzzy feeling. I have thoroughly enjoyed all three books and feel as if Dani is a long lost niece and all I want to do is protect her, giver her a big hug and get to know better. Review of My heart is laughing can be found here. Dani who is almost always happy, deparately misses her best friend Ella ever since she moved away. Some days Dani copes very well but other days are just too much, especially when Vicky and Mickey, the class bullies turn on Dani. When it all gets too much Dani strikes back but that just lands her in a whole heap of trouble. This is a delightful follow-up to My happy life but also a great stand alone. As much as this is a story about bullying it is also a tale of true friendship and loyalty. I think this is ideal for 5 -7 year old readers looking for a first chapter book. As a school librarian, I know how important it is that first chapter books have to connect in order to encourage readers to keep going. This does that beautifully. Eva Eriksson’s gorgeous line drawings bring to life all the emotions; smiles, defiance, loneliness and of course happiness and laughter. So simple but so telling. This combination of author and illustrator is spot on. Younger readers will love this.